Later in a keynote address entitled “However Long the Night,” she noted that religious life finds itself in a “middle passage” with the “in-breaking of something new, of major shifts in our world view with the concurrent breakdown of so much of what is familiar.” The task of remaining in the uncertain place, she added, “is to describe events that shatter all that one knows about the world and the familiar ways of operating within it.” It is from this middle space, she noted, that women religious are called to bear witness to what they know. LCWR members from the local region led the participants in a justice action focused on a call to move toward use of renewable energy sources. Panelists spoke who have been advocating for an end to mountaintop removal in Tennessee and Kentucky and advocating against the pipeline in Kentucky as well as hydrofracking in Ohio. Following their presentation, the LCWR members signed postcards to persons in power positions who have led efforts for clean energy, protecting fresh water, and addressing global climate change issues, expressing gratitude and pledging support for these efforts. Throughout the United States, congregations that are members of LCWR have been making significant efforts to use renewable energy sources as well as to implement many other sustainable practices on the properties they own. The conference passed a resolution to promote the national transition from fossil fuel energy sources to renewable energy sources as soon as possible. The members also passed a resolution to ask Pope Francis to formally repudiate the period of Christian history that used religion to justify political and personal violence against indigenous nations and peoples and their cultural, religious, and territorial identities. More than 270 leaders also joined in a discussion about the needs of and responses to children and families fleeing violence in their home countries and seeking refuge in the United States. The members unanimously affirmed a new LCWR Call, a seven-year plan for the conference. The call enumerates initiatives for working with the evolving realities facing US religious life which includes accompanying congregations in their transformational stages, as well as those immigrating to the United States. Other initiatives involve preparing Catholic sisters for leadership in the emerging intercultural, global reality. In addition, the plan pledges LCWR’s collective voice, resources, and power in solidarity with others to establish economic justice, abolish modern-day slavery, ensure immigrant rights, promote nonviolence, and protect Earth and its biosphere. During the assembly, the LCWR officers updated the members on their work with the bishops delegated by the Congregation for the Doctrine of the Faith to implement a mandate of reform. Following discussion of the update, the members offered direction to the LCWR national board and to the LCWR presidency for its work with Archbishop J. Peter Sartain. Our study, discernment, and prayer led us to reaffirm our strong belief that ongoing conversation with church leadership is key to building effective working relationships that enable both women religious and church leaders to serve the world. It is our deepest hope to resolve the situation between LCWR and CDF in a way that fully honors our commitment to fulfill the LCWR mission as well as protect the integrity of the organization. We will continue in the conversation with Archbishop Sartain as an expression of hope that new ways may be created within the church for healthy discussion of differences. We know that thousands of persons throughout the country and around the world long for places where they can raise questions and explore ideas on matters of faith in an atmosphere of freedom and respect. We believe that the ongoing conversations between CDF and LCWR may model a way of relating that only deepens and strengthens our capacity to serve a world in desperate need of our care and service. During the assembly, LCWR bestowed the 2014 Outstanding Leadership Award on theologian Sister Elizabeth A. Johnson, CSJ, recognized by many as today’s leading US Catholic feminist theologian. The conference honored her work as an educator, public lecturer, writer, and ground-breaking scholar, particularly in the areas of the mystery of God, Jesus Christ, Mary and the saints, science and religion, the problem of suffering, ecological ethics, and issues related to justice for women. At the conclusion of the assembly, Sister Sharon Holland, a member of the leadership team of the Sisters, Servants of the Immaculate Heart of Mary in Monroe, Michigan, assumed the office of LCWR president for 2014-2015. Prior to her election to congregation leadership, she was one of the highest-ranking women at the Vatican where she spent 21 years on the staff of the Congregation for Institutes of Consecrated Life and Societies of Apostolic Life. The conference voted in Sister Marcia Allen, CSJ as its president-elect. Currently, the president of the Sisters of St. Joseph of Concordia, Kansas, Sister Marcia had served as vice-president of her community for two terms (1979-1987); president for two terms (1987-1995) and re-elected to two more terms (2008 -2016); and is also a staff member of Manna House of Prayer. The conference also elected Sister Mary Beth Gianoli, OSF, a leadership team member and congregational secretary of the Sisters of St. Francis of Oldenburg, Indiana as the LCWR secretary. LCWR has nearly 1400 members who are elected leaders of their religious orders, representing approximately 57,000 Catholic sisters. The conference develops leadership, promotes collaboration within church and society, and serves as a voice for systemic change. 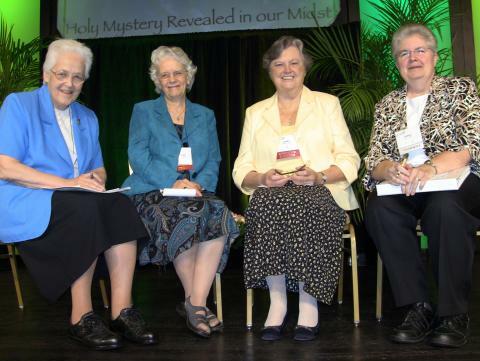 The texts of Sister Carol Zinn, Sister Nancy Schreck, and Sister Elizabeth Johnson, the full text of the LCWR Call 2015-2022, as well as photos of the event are available at [ https://lcwr.org/calendar/lcwr-assembly-2014 ]https://lcwr.org/calendar/lcwr-assembly-2014. Is there a unit of lcwr in Washington dc> When and where does it meet?